Use our online Contact Form – and be sure to include the dimensions and a photo of the project area. 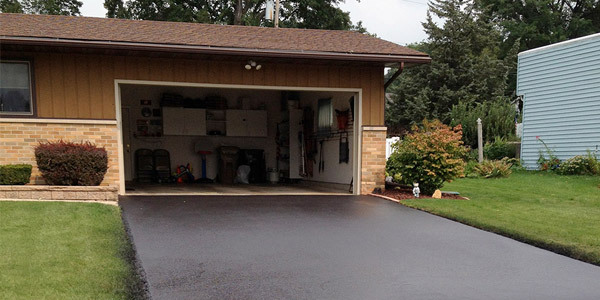 Let Hallman Asphalt repair your parking lot or driveway now. Whether it’s just filling the hole, or extensive repairs, we have a solution for you. 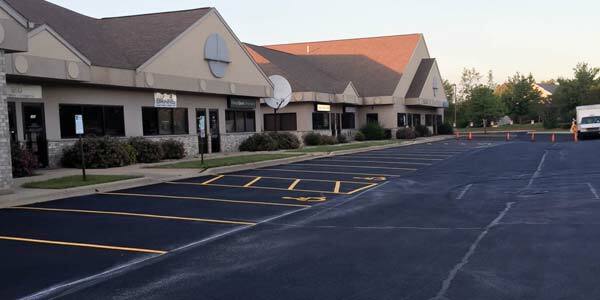 A rich, blacktop parking lot adds valuable curb appeal to your business. 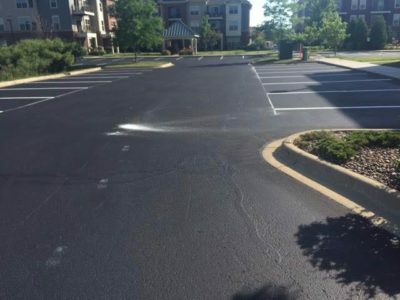 If your parking lot or driveway needs seal coating, crack filling, patch work, pothole repair, asphalt paving, concrete paving or repair, you’ve come to the right place. We also repair and install base work, and fix drainage problems. Locally owned and operated, Hallman Asphalt & Sealing has been a trusted name in Dane County since 1976. You only need to make one phone call and deal with one company. We’ll take care of everything for you. We find and fix hidden problems that other companies miss, saving you thousands of dollars in repairs down the road. Putting a band-aid on a serious problem will come back to bite you later on, and you don’t want that to happen. The worst thing you can do is hire someone who doesn’t know how (or doesn’t care) to protect your investment. You want to identify any problems as early as possible so fixes are quick, easy, and inexpensive. If you wait, the Wisconsin freeze-thaw cycle will quickly take a small problem and turn it into a major headache. 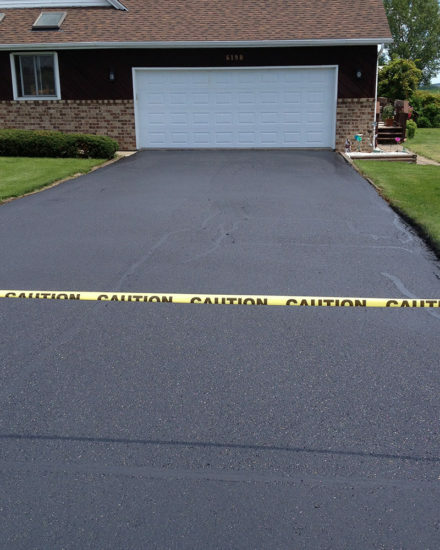 We have the expertise to identify any problems, recommend a fix, and take care of that fix for you, rather than just seal coat your asphalt and leave you to deal with the aftermath. On the other side of the coin, we don’t go looking for problems that aren’t there. Since 1976, we’ve built a business based on being honest with our customers. Repeat and referral business is how we make a living. Our customers love the work we do, and we want to keep it that way. We do it all. We’ll do what it takes to repair and maintain your parking lot or driveway including base work, asphalt paving, seal coating, line striping, even concrete repair and replacement with attendant landscaping. We’re big enough to tackle anything, but small enough to care. No job is too big or too small. Large companies often can’t afford to do the work we do. Yes, they will repair small sections, but not always the best way. Our customers matter to us. We do it right. And while we may sub out some jobs, we’ve done it all, we’ve done it for years, we know how to do it right, and we’ll make sure it gets done right. We keep your business open! Downtime hurts your bottom line. That’s why we do everything we can to keep your business open. If we need to do the project in phases, no problem. If we need to work nights and weekends, no problem. If you need to maintain access to your building for emergency vehicles, we work with you to make sure that’s handled correctly. And you can’t put a price on honest communication. We don’t promise what we can’t deliver. If we say a job will be done by a certain time, it will be done. We work with you to get on the same page, and stay on the same page. We do it right. We’ve done thousands of jobs. We have the equipment and expertise to do it right the first time. We keep it clean. In this business, cleanliness marks the difference between a true professional and a whole lot of wannabes. This is messy work, but that doesn’t mean that your lawn, your business, your home, your garage should get messed up with it. We keep the mess where it belongs, and clean up completely when we’re done. We get it done. Once we start, we finish. And we get it done in the time frame we say it will be done. If we say it will be done by 11:00, it’s done by 11:00. We keep your business open. We plan with you how to keep your business open. If we need to work nights and weekends, we do. If we need to do your project in phases, we do. Whatever it takes, we’ll work with you. We keep you in the know. We communicate. We tell you the truth. We get on the same page with you before, during, and after. No surprises. We don’t break the bank. Our prices are fair and competitive. We do it all. We really are a one-stop shop when it comes to seal coating, line striping, crack filling, pothole repair, asphalt paving, base work, drainage repair, concrete work, and anything related. If we can’t do it, we have partners who can. We want you to be heard because we want you to be happy with the work we do for you. From bid request, to the day of the job, and any final questions after the paving is complete, the employees you talk with on the phone will be the same employees working at your site. Our direct communication model eliminates the kind of errors and customer frustrations that sometimes occur at larger paving companies. Hallman Asphalt & Sealing was founded in 1976 by Bill Hallman. Still locally owned and operated all these years later, Hallman Asphalt & Sealing continues to prove the importance of hard work and traditional business values. Hallman Asphalt & Sealing is a small company with an experienced crew. Many of our crew members have decades of experience. Bill’s son Gavin started learning the asphalt business when he was 12 years old. After graduating from Madison College with a degree in Business Management, Gavin returned full time to take the helm. 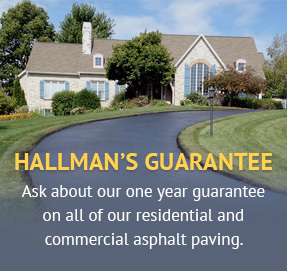 Since our founding, Hallman Asphalt & Sealing has been committed to creating satisfied customers. Our unwavering commitment to reliable and professional service in turn, motivates our clients to recommend us to their neighbors and friends. We are confident you will be satisfied with the finished product and look forward to working with you. Dane County residents pride themselves on the great lengths they take to sustain the natural resources our community. City service departments and several local businesses in the Greater Madison Area have changed their business practices to help sustain our green community. Hallman Asphalt & Sealing has been doing our part for an environmentally friendly community since founding in 1976. What about our business makes us so green? Few people are aware of the benefits asphalt has to offer for commercial and residential paving. 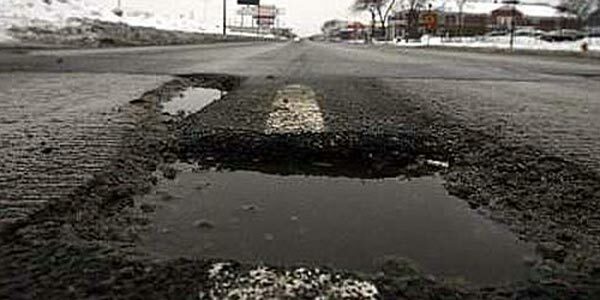 By its very nature, asphalt is one of the most sustainable construction materials. Any paved asphalt can be crushed up, or reused. Last year alone, 95 million tons of removed asphalt was recycled and ultimately repaved according to the Asphalt Pavement Alliance. Hallman Asphalt & Sealing also commits to upholding strict Dane County standards for chemicals used in the seal coating process. These regulations ensure that our customers do not unintentionally contaminate the treasured natural resources Dane County residents enjoy year round. We serve all of Dane County, Wisconsin and surrounding areas including Madison, Sun Prairie, Fitchburg, Middleton, Waunakee, Stoughton, Verona, Deforest, Oregon, McFarland, Monona, and surrounding areas. Not sure if you’re in our service area? Give us a call!